If you’re looking for the best shade solution for your home all year round and find yourself trying to decide between outdoor awnings and quality outdoor umbrellas, then you’ve come to the right place. In this blog, we discuss both options to help you make the best choice. Have you found yourself out in your yard with your hands on your hips, thinking: ‘this place could use a little more shelter’? Either it was raining and there was nowhere to keep dry, or it was sunny but the thought of a hat and sunscreen didn’t seem overly appealing. Does that mean that you should just stay inside? No! Your home is your personal space and you should get to enjoy it all! You want the option to invite the friends and family around for an alfresco lunch no matter what weather, or give the kids some shelter during the day while they charge around outdoors (instead of annoying their mother) during the summer holidays. Well, you’re not alone! Many home owners find themselves pondering the same thing while standing there, watching the weather dictate how they get to use their beautiful outdoor areas. Ideally what you want is a way to reclaim those spots with something that offers protection from the elements, but doesn’t stick out like an eyesore or is difficult to install and use. So, the first thing people do is cast their eyes high to an outside wall and think: ‘awning’. Understandably, it is the obvious solution to this little dilemma due to their popularity over the years. However, have you taken the time to actually consider other options? After all, want both functionality and something with a bit of visual appeal, and most awnings you’ve seen seem to fit the bill. But awnings have their downfalls too. Quite frequently, we hear from both homeowners and builders alike that they decided on an awning, only to find that the property didn’t suit it from a practicality standpoint. This common scenario arises because there is either nowhere appropriate to install it or the area where they want shade is too far for the awning to reach. Additionally, if you’re renting, then you may not have the option to install an awning at all, or an awning may be far too complex or costly to be feasible. This leaves you wondering what other alternatives you have to choose from. You want shade, but is there something else you could consider? Well, it may be time to bring outdoor umbrellas into the mix and see how they open up your world. What Does the Umbrella Hold? Umbrellas are not just for urban cafes or resorts in Hawaii any more- they’re perfect for your house too! 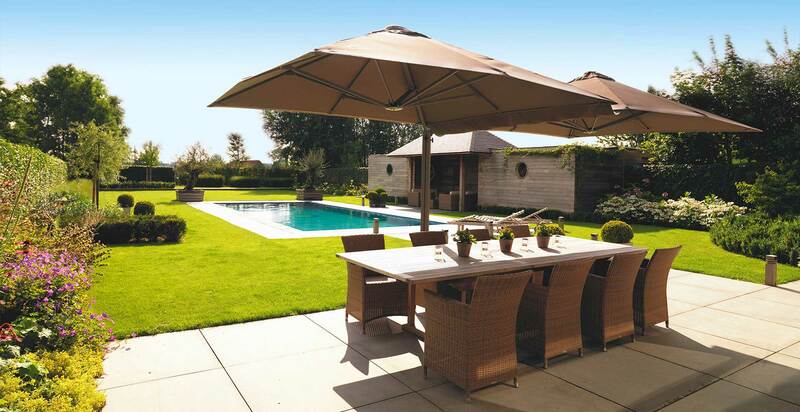 You’ll be surprised at the large range of versatile umbrella options available today that are perfect for creating your own family haven in your garden. Unfortunately, a lot of people often don't even think about an umbrella as an option because they haven't heard of a proper, high quality product that would suit their needs. Take, for example, our Shadowspec range of outdoor umbrellas which are specifically designed and perfect for home and commercial use, providing a shady retreat for visitors and a great place to sit and enjoy the outdoors out of the often oppressive and damaging sunshine, or the wind and rain. So now that you know all about outdoor umbrellas as a viable option for your home, how do you decide which is the best solution for you? One of the most important factors when making the decision is when the awning or umbrella is shielding you from. For protection from the elements, umbrellas are usually the winner due solely to their versatility. While retractable awnings offer good sun protection as well as some shelter from rain and wind, an outdoor umbrella can be transformed into an entire outdoor haven. Obviously, when deciding your best option, you need to consider the ways you are going to be using the shade. For example, the direction your home faces will impact the behaviour of the sun during the day- will this influence your decision on how to get the best coverage? Umbrellas may offer you a way to select a better position than perhaps installing an awning. How about who will be using it? Awnings offer a lot in this regard as their lack of poles and posts keeps them out of the way, making them more convenient and safer for children and pets. However again, some of the restrictions which come with an awning, such as installation limitations, may mean that an umbrella is your best choice. Price always has a major influence on homeowners when deciding which is the most cost-effective option. In this case, the outdoor umbrella almost always wins, as folding-arm, retractable and architectural awnings can be quite expensive, especially when installing a few at once. Lifespan should always be a key consideration, as outdoor environments can be quite unforgiving. Firstly, it comes down to the quality of the product; the awning or umbrella that you purchase from a lower end brand probably won’t fare well in heavy rain or wind, or offer you the UV protection you desire, compared to a more reputable brand like Shadowspec. Both high quality umbrellas and awnings will last quite a number of years, especially if they are correctly taken care of, stored and cleaned the ways suggested by the manufacturer. So there is no obvious winner here, however it does come down to how easy they are to look after, and due to the stand alone nature of an umbrella, this may present a better alternative for you. Judging from all of the considerations and factors above, which is a better option for your home? An awning or an umbrella? While an awning is often first thought of, it’s becoming clear that an outdoor umbrella may be a viable option for you and your home. So, let’s look at umbrellas more closely. Outdoor umbrellas offer you flexibility in both location and fixture options, meaning you can either select a heavy base with wheels which will hold it down but still allow it to be physically moved, or choose a more permanent location by concreting the umbrella into a slab or the ground itself. Either way, it’s completely up to you how best to suit your style and set up. Outdoor umbrellas don’t require the assistance of eves or gables, or strong fitting points to a pre-existing house or building, which means you are not restricted to the borders or outskirts of your outdoor areas. Gone are the days where outdoor umbrellas were flimsy and easily torn. You can now use your favourite awning material on your umbrella, meaning that there is no reduction in quality when comparing both options. Most high-quality outdoor umbrellas, like Shadowspec, have advanced design options to offer you and your family better protection. For example, a ‘rain gutter’ can be zipped between two or more umbrellas, increasing the coverage into one single, large area. It’s common to think that large outdoor umbrellas are clunky and heavy, or difficult to manoeuvre, however there are brands on the market such as Shadowspec, that are designed specifically to be easy to use, simple to open and require little effort to store. Outdoor umbrellas come in all styles, shapes and designs, which means you have the versatility to select the best match for your house, whether that be colour matching or a statement motif. So, if you’re sold on umbrellas, we’re glad! As we love them too! So, how can we help you? We understand homeowners like yourself, which is why, when considering an outdoor umbrella for your home, Shadowspec is your perfect shade solution partner because attractive, premium quality, trouble-free umbrellas are our speciality. We offer a wide range of options and products to suit your specific requirements. How can Shadowspec help you decide on the best option? We want to help you choose the best solution for your home! That’s why we offer complimentary quotes and proposals, professional advice and recommendations which are completely obligation free. That way, there is no pressure, and you get all of the information you need to feel comfortable about making the right decision. Outdoor Umbrellas: Many types and sizes to choose from! 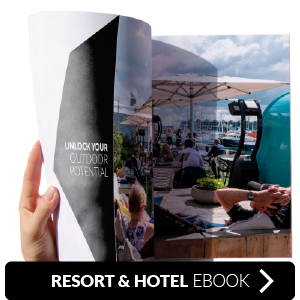 Whether you need a small amount of sunshade for a deck, pool area or backyard, or a larger option for commercial use such as a restaurant or café, you will find the ideal solution with Shadowspec. From centre-pole and off-set designs, to single and multiple umbrella configurations, we have solutions no matter what your requirements! All Shadowspec Umbrellas are available anywhere in Australia we have bases and dealers throughout the country, including in Sydney, Melbourne, Brisbane, Adelaide and Perth. Discuss your Umbrella needs with us now! 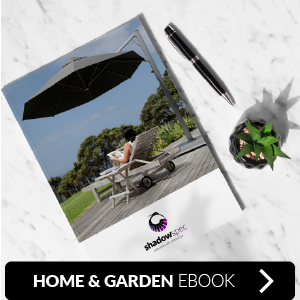 To discover which umbrella option is going to suit your outdoor area best, simply get in touch with us or download our catalogue to survey the range for yourself. Our friendly and helpful staff are happy to answer any questions and provide expert advice to help you find a product that is right for your needs, space and budget. With international award-winning designs, affordable pricing and excellent quality, Shadowspec is the best choice for all shade umbrellas.